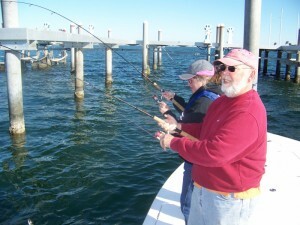 Today i guided Mr. Johnson and his wife Brenda on a fishing excursion down the Intracoastal waterway to Pensacola Pass. After a big night of Floundering, i met the Johnsons just after lunch and we began our quest for Redfish and Trout. With artificial baits rigged and ready we hit the first spot and were bringing Trout to the boat in just a few short minutes. After countless double hook-up’s, many fish were released, some were in the box and we were off to the next location. At the next hole while anchored in the pass, we had a close encounter with another boat that was drifting by but after that we were able to drop the live baits in hopes of enticing a nice Redfish. Just a little time passed with no action and i decided to pull anchor and drift for the Reds to cover a little more ground with the incoming tide. As i began to pull the anchor from 65′ of water it felt like i was pulling up a Volkswagon. The Volkswagon kept coming up but the Captain was starting to tire with each grasp of the rope. When the nightmare on the end of my rope was visible (Just before i collapsed) it was obvious why i was exhausted. The gentleman that drifted by with his anchor hanging off the bow had hooked our rope and eventually was anchored about fifty yards down current of our position. As i was trying to pull our anchor up, i was actually pulling up both anchors and tugging his 24′ boat against the current. Once i had both anchors up i sent his back to the depths. I dont think he ever realized we were entangled and definetely didn’t drift on top of us on purpose, he had kids on the boat and was just out trying to catch fish. 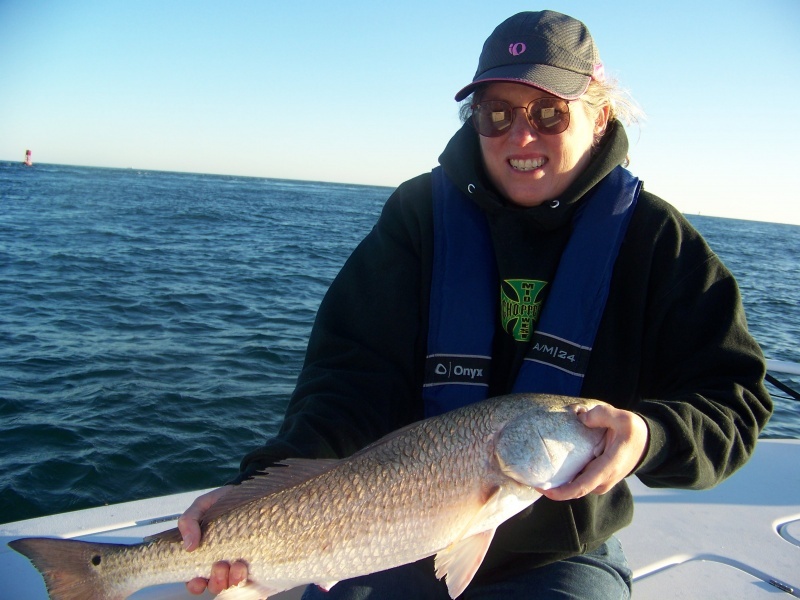 After i caught my breath, we began our drift and were rewarded quickly with a 28″ Redfish. Being Brenda’s first Red it was a big moment for all. After a few pictures and a good release we went for an attempt at some Flounder and more Trout. We ended the day with loads of Trout caught, a nice Redfish and lots of memories. I look forward to spending time with the Johnsons in the future and would like to thank them for two great days of fishing adventures.